Salad dressing seems so simple. Just go to store and buy bottle of your favorite salad dressing, measure in the 21 Day Fix orange container, pour onto your salad, and enjoy! There is only one problem with this: store bought salad dressing is often not only a source of hidden calories and sugars, but hidden ingredients that you want to try and avoid when following the Fix diet. With just two ingredients you can make a simple dressing that is full of flavor. I like to use a first pressed, cold pressed organic extra-virgin olive oil. This way you get a full flavored quality oil that does not use heat or chemical methods of extraction. With the balsamic vinaigrette you can get creative and use a naturally flavored vinegar this like pomegranate or citrus flavored. Take 3/4 cup olive oil and mix with 1/4 cup balsamic vinaigrette. Store in glass bottle and refrigerate. What I love about this base recipe is how easy it is to add other spices and ingredients to mix up the flavor. Making your own dressing is less expensive than store bought, plus you know always know the exact ingredients going into the dressing. Many of the dressings that come in the meal plan contain contain perishable ingredients – unlike the base recipe I’ve posted. Be sure when you make any that contain egg or yogurt, to use them up before they go bad. Balsamic Vinaigrette – this classic dressing is not only great over salads, it can also be used as a dip for cut veggies..
Creamy Herb – this avocado-based dressing is perfect for dipping veggies or can be used as a salad greens dressing. Lemon Tarragon Vinaigrette – here is another dressing for salads, but also makes for a tasty glaze on your lean proteins. Dijon Vinaigrette – a classic vinaigrette with a base of olive oil and red wine vinegar. Asian Citrus Vinaigrette – a little orange juice added to this traditional vinaigrette adds a unique flavor, great for a chicken or steak stir-fry. Asian Vinaigrette – a blend of rice vinegar, Tamara, honey, ginger, and sesame oil. Raspberry Vinaigrette – fresh raspberries and Greek yogurt are used to make this vinaigrette. Lemon Dijon – simple mixture of egg, Dijon mustard and spices. Caesar – a creamy dressing made with Greek yogurt, Parmesan cheese, anchovies, olive oil, and other spices. Honey Mustard – Greek yogurt, Dijon, and raw honey-inspired dressing. 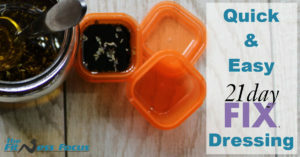 The 21 Day Fix container used to measure dressings is the orange container. If you have ever wondered why the Fix comes with two orange containers even though you are only allowed one orange container daily despite your calorie level, here’s my theory. 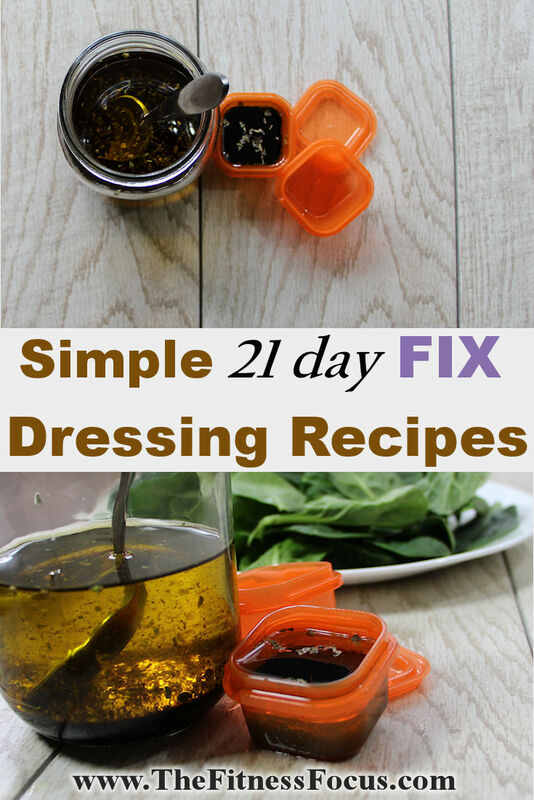 The salad dressing recipes in the 21 Day Fix eating plan make about two servings each. I believe the nice people at Beachbody provided us with two orange containers to make meal prep and clean up easier. The 21 Day Fix is a whole foods-based diet, this means you are going to want to avoid processed ingredients as much as possible. Learning to read salad dressing labels is a great skill to have. When you are looking at the nutritional value in salad dressings, pay close attention to the ingredients listed. Even if the label of the dressing you are looking at says organic, you still want to be careful and double check the ingredients. Just because it says organic does not necessarily mean it’s healthy. Nature’s Promise – This is Stop N’ Shop’s brand of natural ingredient dressing. My only harp with this product is that some varieties do use soybean oil as an ingredient. Tessemae’s All Natural – We were turned onto this brand from my Aunt. We were looking for a whole foods-based barbecue sauce and discovered a wide range of natural and organic dressings here. To the right is a screenshot of the ingredient list from the Tessemae Lemon Garlic dressing. The ingredient section gives you an idea of what to look for when selecting a store bought dressing. I have yet to find the Tessemae brand in store, although we don’t have a Whole Foods or Trader Joe’s anywhere close to us. My local Target carries Tessamae. Near the bagged salads, under refrigeration, not with the other bottled dressings. Good to know! Thanks Shannon. We just toss it in the Ninja and give it a whirl before pouring on. It stores well in the fridge too if you aren’t feeding as many people. Thanks for sharing Charity! That sounds delicious. Good Concept of health base foods. Inclusive with Veg & Nonveg foods.